I had an issue where pc starts to boot than pauses for 40 seconds while Windows logo and dots are spinning, no harddrive activity and keyboard and mouse are powered off, after 41 seconds boot proceeds as normal. I used Windows Performance Analyser as per this post. 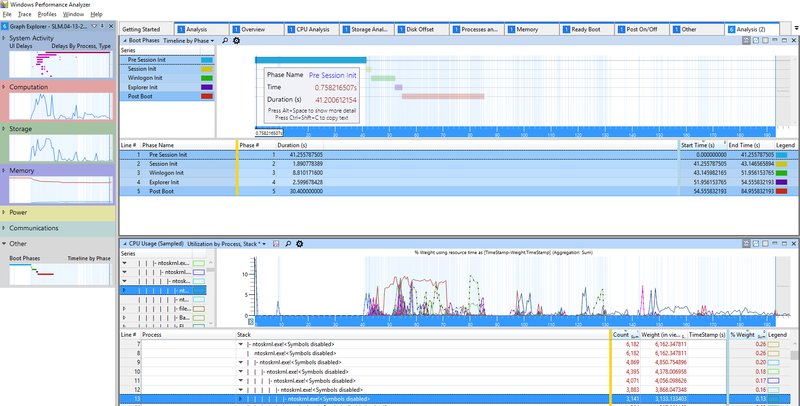 Investigation in Windows Performance Analyser shows Pre Session Init taking 41 seconds mostly doing idling. Some process activity was detected at ntoskrnl.exe and ACPI.sys which led me to believe driver initialisation issues. Various attempts to disconnect devices from motherboard pointed at DVD drive, diconnecting it reduced Pre Session Init from 40 to 10 seconds. Next, I attempted to tweak BIOS settings for SATA controller, particularly Aggressive Link Power Management, when it is off then there was no delays in boot. I hope this research would help someone. Not the answer you're looking for? Browse other questions tagged windows windows-10 boot performance or ask your own question.